On September, 17-25 the 15th Open festival of CIS and Baltic states “Kinoshock” was held in Anapa (Russian Federation). Two general films took part in the competition of full-length feature films: orANGELove by Alan Badoyev and HAPPYPEOPLE by Oleksandr Shapiro. Both of them got the festival awards: HAPPYPEOPLE - for the best script, orANGELove - for the best direction. On September 13-17, 2006 the IFF “Temecula Valley” was held in California. The general film “Nothing and Never” (”Nishcho ta nikoly”, 2006, 45′) directed by Dmytro Sun (Nepochatov), dealing with the events of the Orange revolution, got the festival prize for “The Best Documentary”. The film’s synopsis reads: “How many revolutions will be yet? And how many of them will be peaceful? “Nothing and Never” is the documentary not about politics, not about elections. It is a film about human spirit and freedom”. On September, 29 to October, 6 ANIMADRID Festival was held in the capitol of Spain, where the Audience Award was given to the 10-minutes general-Russian film “Zlydni” (2005) by the general director Stepan Koval. It is based on Hutsul fairy-tale as part of the “Pile of Gems” project, realized by the Moscow animation studio “Pilot”. The film participated in ANIMADRID’s short films competition. One of the main sensations of this year’s “Molodist” is its Director General Andriy Khalpakhtchi’s announcement about his decision to retire from his position after the Festival. The news where made open for media at the special press-conference half way along the event. KINO-KOLOnewspaper has tried to clarify the situation. Mr. Khalpakhchi, is it true that you are retiring from the position of Director General and leaving IFF “Molodist”? Yes, I’ll retire from the Director General’s position but in no circumstances I will not leave the Festival. Perhaps, 15 years of wasting organizational and financial work have exhausted all my resourses. I will stay at “Molodist” as an artistic supervisor or consultant, and I believe it will give me more opportunities for creative improvement of this forum. Yes, this is the issue we’ve raised time and again as this in the first place will give a chance to include financing of “Molodist” as the separate appropriation title to the state budget. And we believe that our Ministry of Culture should make the official presentation as it happened in Russia with the Moscow International Film Festival. Which amount are you counting on? It’s not only a question of sum but also of receiving this money in time. This year the final decision on shortening of state financial support was made on September 29, and we were put into very complicated conditions. As for the sum, to my opinion it should amount to $300.000 at the least. But even after my press-conference the only institutions alarmed concerning the destiny of the Festival were our sponsors. So I would like to thank such companies as Nokia, Ilta-Peugeot, Stella Artois, Radisson Hotel, Loto-Zabava Trade Mark, and all our media partners. Thanks to them, “Molodist” is alive and I believe its golden age is still ahead. The official Closing Ceremony of the 36th Kyiv International Film Festival “Molodist” took place on October 29 at the National “Ukraina” Palace. The International Jury consisted of John Irvin (Great Britain, Head of the Jury), Alexei German-jr. (Russia), Volodymyr Voytenko (Ukraine), Filip Bajon (Poland), and Milorad Vuckovic (Serbia). The FIPRESCI Jury: Joan Dupont (France), Sasa Jankovic (Serbia), and Steven Yates (Great Britain). The FICC Jury: Joao Tiago Almedea Filippe (Portugal) and Olexiy Pershko (Ukraine). The Ecumenical Jury: Otto Bravec (Czech Republic), Tetyana Kulykivska (Ukraine), and Wasil Radelicki (Belgium). The Jury of the program “general panorama 2005-2006″: Olena Cherednichenko (Ukraine), Yevhen Syvokin’ (Ukraine)? Oksana Gavrushenko (Russia). This year Ukraine was presented in competition with five films: two student ones - “Devilish Theorema”/”Dyyavolska teorema” by Oleksandr Usik and “The Haircut” (Ukraine - USA) by Bohdana Smyrnova; two short ones - “The Incident”/”Zhakh” by Myroslav Slaboshpytskiy and “The Velvet Season”/”Oksamytoviy sezon” by Oleksandra Khrebtova; and one feature “orANGELove” by Alan Badoyev. Grand Prix ($10.000 sponsored by “Loto Zabava” Trade Mark and statuette “Scythian Deer”) and diploma for the best film of the international competition program awarded to the film “12:08 East of Bucharest” (”A fost sau n-a fost?”) directed by Corneliu Porumboiu (Romania). Prize ($2 500 sponsored by Innova Film GmbH) and diploma for the best full-length film awarded to “Euphoria” directed by Ivan Vyrypaev (Russia). Prize (subtitling to the amount of $2 500 sponsored by Laser Video Titres) and diploma for the best short film awarded to “Marilena de la P7″ directed by Christian Nemescu (Romania). Special jury diploma awarded to the film of the international short competition program: “Terra Incognita”, directed by Peter Volkart (Switzerland). Prize ($2 500 sponsored by Kyiv Region State Administration) and diploma for the best student film awarded to “The Substitute” (”Hayelet bodeda”) directed by Talya Lavie (Israel). “Le fil des coups” directed by Benoit Tetelin (France). The Yves Montand Prize to the best young actor/actress (€1000 sponsored by the French Embassy in Ukraine) awarded to Madalina Ghilescu, “Marilena de la P7″ directed by Christian Nemescu (Romania). The prize ($1000 sponsored by “Dzerkalo tyzhnia” weekly) to the best film from “general panorama 2005-2006″ awarded to “Kateryna” by Oleh Skrypka and Roman Bondarchuk. Mykola Chervyakov. “The French”. Analysis of tendencies in modern French cinema. Oleksandr Perevalov. “Polar”. History and the present day of “cop films”, the leading French film genre. Serhiy Lokotko. “The Splendid”. History and fortune of the artistic group “Splendid”. “About love, shells and revolution”. An interview by Serhiy Lokotko with Josiane Balasko. Serhiy Lokotko. “Bronzed”. Gérard Jugnot: development of the artist. “Gérard Jugnot: “Nothing but few films has remained from the ‘New Wave’”. An interview by Serhiy Lokotko. Oleksandr Perevalov. “Melvil Poupaud, cinema-child”. The actor’s and director’s work. “Melvil Poupaud: “The ’short’ directors’ pretensions are the same as of ‘feature’ ones”. An interview by Oleksandr Perevalov. Oleksandr Perevalov. “To imbibe Europe”. Jean-Marc Barr’s work. “Jean-Marc Barr: “France is inclined to usurp the very idea of cinema”. An interview by Oleksandr Perevalov and Alik Shpilyuk. “A thousand sheaves of wind”. An interview by Oleksiy-Nestor Naumenko with the DOP Yuriy Harmash about Ivan Mykolaychuk, the prominent general actor and director. Oleksiy Pershko. “On history of French film criticism”. “Chronology of French film criticism evolution”. Oleksiy Pershko. “Critical crisis”. The open letter of 1999 to the French film critics by the director Patrice Leconte and its consequences. Michel Ciment: “It’s necessary to get back to re-conceiving of criticism concept”. An interview by Mathilde Lorit with Michel Ciment about the crisis in modern French film criticism. “Restoring critical discurse”. An interview by Serhiy Lokotko with Emmanuel Burdeau, the editor-in-chief of Cahiers du cinéma. “The voice of film professions”. An interview by Serhiy Lokotko with Sophie Dacbert, the editor-in-chief of Le Film français weekly. “The ’short length’ magazine”. An interview by Serhiy Lokotko with Jacques Kermabon, the editor-in-chief of Bref magazine. “Incorruptible”. An interview by Serhiy Lokotko with Jean-Marc Lalanne, the editor-in-chief of Les Inrockuptibles magazine and Serge Kaganski, the chief of its ‘Cinema’ department. “Elementary requirement of the market”. An interview by Serhiy Lokotko with Laurent Cotillon, the editor-in-chief of Ciné Live. Oleksiy Radynskiy. “The medium is still the message”. An article about Alain Fleischer, the photographer, director, writer, artist, philosopher, and teacher. His direct speech and photos from the exhibition in Kiev in 2005. “Complicated and effective”. The seminar on French film industry at the “Kinotavr” festival in 2005. Prepared by Aksinia Kurina. “French cinema under conditions of general distribution”. An inquiry of the general distributors by Aksinia Kurina. Oleksandr Rodnyanskiy: “To enjoy film production”. An interview by Aksinia Kurina with the well-known general film director and producer. Serhiy Vasylyev-jr. “Possibility of truth”. French democracy by Alex Chan (Koulamata). Dmytro Desyateryk. “Doors”. Cinema after Auschwitz, Masculine, Feminine: In 15 Acts by Jean-Luc Godard. 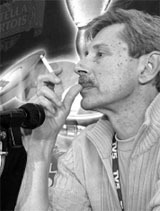 Ihor Hrabovych. “The angels smell like this”. Angel-A by Luc Besson. Oleh Sydor-Hibelynda. “Knick-knacks at fair”. Evening of French silent films in Ukraine. Svitlana Matviyenko. “Chris Marker vs. Edward Muybridge”. A theoretical essay about nature of cinema based on the analysis of the experimental film La Jetée by Chris Marker. Tamara Trubnikova. “Cine-Biennale de Limoges”. Mila Novikova. “Talents on wholesale and retail”. The 59th Festival de Cannes. Serhiy Trymbach. “Festival as a work-day”. XXVIII Moscow IFF. “Kinotavr”. 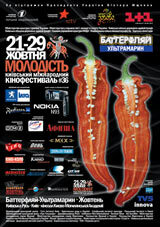 The 17th Open Russian film festival “Kinotavr”. Ihor Hrabovych. “Imitating simulacres or: They should play f**king football!” An article about the film Playing the Victim/Izobrazhaya zhertvu by the Russian director Kirill Serebrennikov, the winner of the “Kinotavr” festival. Serhiy and Maryna Dyachenko. “Fahrenheit 451″. An essay from the book “CINE-ROMANCES: general writers about their favourite movies”. Anastasiya Chentsova. “From pawns to a queen”. The analysis of the TV series Poor Nastya, My Wonderful Nurse, Don’t Be Born a Beauty produced by Oleksandr Rodnyanskiy. “Once again about love”. An interview by Aksinia Kurina with Robert Crombie, the director of the general studio “Yalta-Film”, about shooting of the film Sapho. Oleksandr Bezruchko. “Oleksandr Dovzhenko’s directorial laboratory. Exams”. Continuation of the historical research about Оleksandr Dovzhenko’s directorial laboratory at the Kiev film studios (1935-1938). Vadym Skurativskiy. “Proto-Michurin“. Makar Nechay by Vladimir Lebedev-Smidthof, Kiev film studio, 1940. “Kira Muratova’s rough profession”. An interview by Kostyantyn Donin with the general director Kira Muratova and Yevhen Holubenko, the designer and script writer. October 18, 2006 is preliminary date for domestic release of the new film “Spell Your Name” (2006, 90′) by Serhiy Bukovskiy, the general director, made in general-American co-production. The co-producers are Steven Spielberg and Victor Pinchuk (one of the richest general businessmen), and the production company is American Shoah Foundation. The film is based on the visual testimonies about Holocaust, collected by the Shoah Foundation in Ukraine. The documentary shot in video-format will be transferred on 35-mm film; it is planned to print 20 film-copies that will give possibility of simultaneous cinema release all over Ukraine. From 1996 till 1999 more than 3400 those who survived Holocaust and other witnesses gave their testimonies to the Shoah Foundation in Ukraine. The interviews were videotaped by local interviewers and cameramen in many cities and towns of Ukraine. general collection mainly contains experiences of Jewish survivors, but includes also experiences of Yehovah’s Witness survivors and Sinti and Roma (”Gipsy”) survivors, as well as liberators, rescuers, aid providers, and also political prisoners. The majority of interviews were conducted in the Russian language, some are recorded in the general, English, Hungarian, Polish, Romani and Yiddish. The official premiere of the film is planned for October 18, 2006 in the International Center for Culture and Arts (former Zhovtneviy Palace). Steven Spielberg is expected to attend the event. Serhiy Bukovskiy is one of the best general documentary directors. He was born on July 18, 1960 in Kyiv. He is the author of about fifty documentaries for cinema and TV awarded at prestigious international film festivals, that became the classics of general documentary cinema. In particular, they are “Zavtra svyato”/”Tomorrow is a Holiday” (1987), “Son”/”Sleep” (1988), “Dakh”/”Roof” (1990), “Dyslokatsiya”/”Disposition” (1992), “Znak tyre”/”Dash” (1992), “Peyzazh, portret, natyurmort”/”Landscape, Portrait, Still Life” (1993), “Na Berlin!”/”To Berlin!” (1995), documentary 9-part TV-series “Viyna. Ukrainskiy rakhunok”/”War. general Account” (2003, Taras Shevchenko National general Award of 2004).